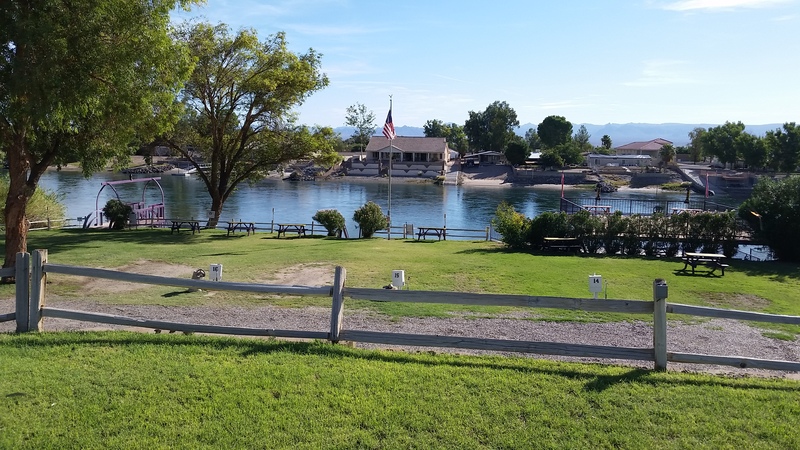 a river front gem in Needles California – RV Cheaper! July 11, 2014 December 29, 2014 RV Cheaper! We spent much of the day waiting for the RV repairs in Mojave, so we only made it as far as Needles instead of Williams. Because of that we literally stumbled upon Fenders RV Resort on the banks of the Colorado River. It was late, dark and we couldn’t find any places (with hookups for A/C) after driving past Fenders. From the road, in the dark it looked a little iffy, but we came back and hooked up. In the morning I was shocked to see how nice of a place this was. There are six large RV spots on the banks of the river, a boat doc and double level patio sitting above the water. Since it was July, our AC ran most of the night but if you enjoy water sports this would be an awesome place to hang out for a few days. Given the view, it would be a great place during cool weather as well. You just never know what kind of gems turn up! Some of my photos are missing and in this one you can’t see how accessible the river front sites are. The gravel drive is wide and looks very easy to navigate an RV when you are down there. I did a panorama to show all of the spots. Next gotta pinch pennies to RV Cheaper!